2014 UnitedHealthcare US OPEN Coming Soon! Record turnout expected for the greatest racquetball event of the year. 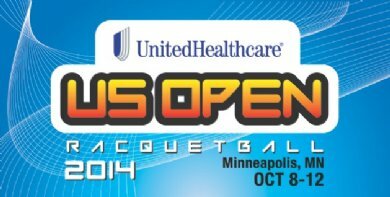 The 2014 UnitedHealthcare US OPEN, the world's largest and most prestigious racquetball tournament, will be held October 8-12 in beautiful Minneapolis, MN. IRT, LPRT, and CPRT as well as over 600 amateur competitors. Age and skill divisions are offered in both singles and doubles. divisions for Men, Women, and Mixed teams. 2014 will debut a new $8 million total renovation of the main host club. and all new locker rooms with cherry wood lockers. complete with Pro/GOLD Lounge Access for the week. the top pros in an intimate Lounge setting. Cost is $2,800 for the 4-person box or $800 for an individual seat. Please call (614) 890-6073 for availability as space is extremely limited. Wednesday evening during the Championship. the pro partner and food/drink for the evening. Donation to St. Jude/JDRF is $325. Please call (614) 890-6073 or click here to sign up. Every hotel room sold out more than a month in advance last year. Special rates have been negotiated at these hotels. Once the room blocks are full these rates will no longer be available. around the world often gather in the restaurants and lobby areas. Don’t take a chance - book your rooms today! immediately preceeding the US OPEN. most comprehensive instructor certification available. Features the country's best junior racquetball players will be competing for gold medals. Features more than 40 high schools from across the country. The event will be hosted at the Multnomah Athletic Club, one of the premiere clubs in the country. Don't miss your chance to play in one of the best doubles tournaments of the year in beautiful Tempe, AZ on the campus of ASU. Don't miss your chance to play in one of the best doubles tournaments of the year. National Singles and Grand Slam Event Combined With the Stunning Made-For-TV Stadium Racquetball Court. Also the Men's and Women's U.S. Team Qualifier Divisions Will Be Played. Upcoming US OPEN Racquetball Championships entry deadline has been extended until Sunday-September 25 at 10pm CT. The sports only Grand Slam event combined with the stunning made-for-TV stadium racquetball court. Also, over 700 amateur players competing for US OPEN titles. The 2010 USA Racquetball National Singles Championships will be held May 26-31, 2010 at the Downtown YMCA in Houston, TX. This is a recap of the 2010 US OPEN Racquetball Championships held at the LIFE TIME FITNESS in Minneapolis, MN.